Selection of teas from Rishi Tea. Selection of teas from Rishi Tea, shaken over ice and served cold. Ruby Coffee's Seasonal blend. Starring this week on espresso, may make an appearance as house coffee as well. A blend of two different lots from El Macizo in Huila Colombia. Creamery is a great espresso. Solid chocolate base, with some cherry notes. Makes an awesome cappuccino. We look after our friends who don't want caffeine. Death before decaf? Nah, you're just drinking the wrong decafs. An ethyl-acetate (Sugar Cane) Process Decaf, which removes caffeine while still leaving a very tasty coffee. You probably wouldn't know it was decaf if we didn't tell you. It tastes great, for when you want coffee, but don't need anymore caffeine. Washed Pacamara variety, grown by Gila Carrascal in Northern Ecuador, on her 15 acre farm. The fruit sweetness and clean taste of well-grown coffees from Ecuador have been among our favorites for the last couple of years. Fun Fact: Jason has climbed Mt. Pichincha, the active volcano that the region is named for. Washed coffee from the Ortiz family farm. Washed process, SL-28 and 34 varieties from the Kiaguthu Factory, grown by the Othaya Farming Co-op. Bright and sweet, with solid fruity notes and a refreshing finish. 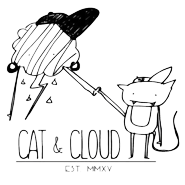 There is a lot to say about Cat & Cloud. I have been watching Chris Baca and Jared Truby from afar for years. They recently launched a roastery and cafe, but may be best known in coffee circles for their eponymous coffee podcast. They are some long-time coffee celebrities. That’s cool and all, but we are drawn to them for a different reason. The values they express in terms of buying and serving coffee with hospitality really jibe with us. If I had to pick one thing that made us want to work with them so badly, it is their program for creating sustainable coffee careers for their staff. They are focused on helping staff grow, and then investing back into their employees. For example, they set up from the beginning a profit sharing program and a plan for staff joining the ownership over time. I love this approach to making coffee careers sustainable. Something needs to change in the coffee company model to bring the right people into the industry and give them room to grow, and I am watching C&C as an example of what is possible for Journeyman in the future. Ruby is a small company started by someone with massive roasting expertise who moved to a smaller community. Jared Linzmeier took the green buying and roasting experience gained at Intelligentsia and Cafe Ladro, and moved home to Central Wisconsin to do his own thing. We appreciate people who are working outside the "cool" places with the happening coffee scenes, building up their local communities.